The AmaDrum is used to check the quality of water from the rivers and purifies it. The Council for Scientific and Industrial Research (CSIR) has introduced a range of technologies aimed at improving the quality of water in rural and peri-urban areas across the country. According to the CSIR, the new technologies, aimed at enhancing service delivery and the performance of the municipalities, were developed due to the non-functional water infrastructure and intermittent water supply in rural areas around SA. After months of undergoing a trial phase, the technologies were exhibited at the Municipal Managers Forum, hosted by the South African Local Government Association in partnership with the City of Mbombela Local Municipality last week. The showcased technologies include: the Corrective Action Request and Report System (CARRS), the AmaDrum technology; and a mock-up of an autonomous cleaning system which is yet to be developed by the SafeWaterAfrica project, says the CSIR. "There are many challenges facing rural communities as far as water supply and water purification is concerned. During interrupted water supply we have seen some communities resorting to using unprotected water sources such as rivers and hand dug wells," says Goodhope Maponya, senior researcher at the CSIR. "The Corrective Action Request and Report System (CARRS) is a Web-based incident management system aimed at assisting community members to report water service delivery issues they may experience in their communities, using a mobile device. This project is currently being piloted in eight district municipalities around the country." Some communities, he adds, leave containers in queues for days, waiting for water supply to return while their municipality is not aware of the shortages. 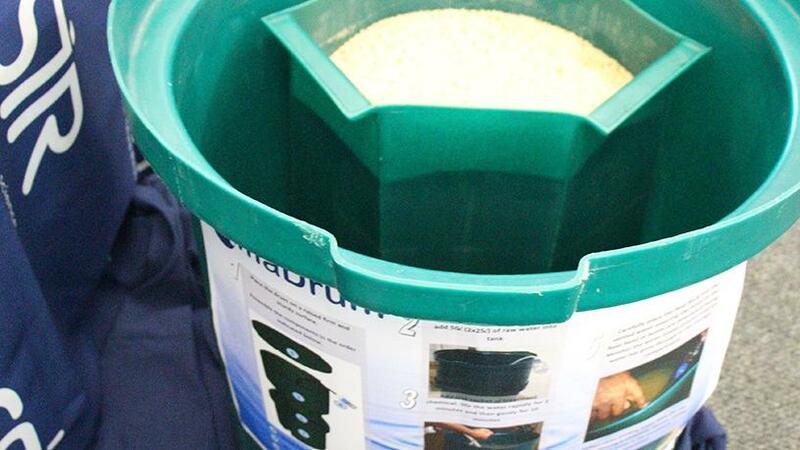 Bongi Maposa, senior researcher at the CSIR, says the AmaDrum is a household-based water treatment and safe storage system aimed at households that do not have access to treated water. "The AmaDrum is used to check the quality of water from the unprotected sources, thus reducing risk of disease such as gastroenteritis, diarrhoea, and cholera among others. The technology, which is a drum with two compartments of 50L each, is connected to an intelligent device which uses a flocculant-disinfectant in the first step to purify the water, followed by some sand filtration. "The technology then allows for safe storage of the treated water where it remains covered during storage, and is safely withdrawn through a tap when it is needed in the household." This technology, adds Maposa, is been piloted in Nkomazi local municipality, Mpumalanga and has been rolled out as part of a water services delivery project in the province. The researchers at the forum also discussed plans around an autonomous cleaning system, which will be developed by the SafeWaterAfrica project, a collaboration by a large consortium of researchers and entrepreneurs in SA, Mozambique, Italy, Spain and Germany. "The Consortium is seeking to develop a decentralised autonomous, self-cleaning water treatment system with low energy requirements for use in rural and peri-urban areas. One of the key aspects of the project is that it aims to have the system produced locally once the development is completed," explains Maposa. "The water treatment system employs a number of innovative technologies: carbon-based electrochemical oxidation for organic substances, a carbon dioxide evolution measurement system for monitoring microbial pollutants, a water quality management system for remote water quality control and another remote system for monitoring and quality control. The system is intended to be powered by solar energy supply." The CSIR's introduction of water-purifying technologies comes at the backdrop of Western Cape's drought, which has seen the province mobilising citizens to seek creative ways of saving water. Despite Day Zero being pushed out from an earlier anticipated 12 April to 4 June, the threat of taps across Cape Town running dry in less than four months represents an opportunity for local start-ups to innovate. The city has introduced initiatives and accelerator challenges inviting innovations and water-saving solutions from start-ups. Earlier this month the TinyLoop team was named winner of the H2O (Hack Two Day Zero) #DefeatDayZero hackathon held in Cape Town in attempts to find digital solutions that will push back Day Zero. The team developed an innovation that will enable users to shower for an unlimited time without exceeding the 50 litres per person limit. Earlier this month Helen Zille, premier of the Western Cape, attended the launch of Retief Krige's WaterLoo grey water bank solution and has committed to meet more local start-ups that are innovating to solve the city's water challenges. The WaterLoo is a smart, low-tech problem-solving solution to help households save drinking water. The city is currently operating an online water map to assist in water usage tracking.